The Waimakariri District has plenty of opportunities for cyclists, including off-road tracks alongside the Ashley/Rakahuri and Waimakariri Rivers. The District has two cycle and walking paths that were jointly funded with the NZ Transport Agency through the Urban Cycleways Fund. 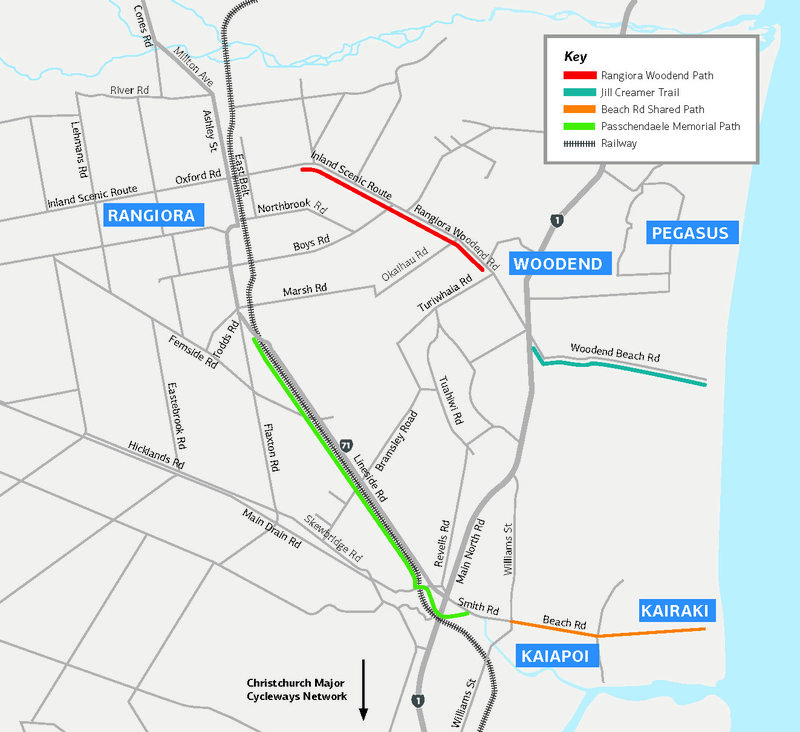 The 6.5 km Rangiora Woodend path connects the Woodend township to Rangiora and runs alongside Rangiora-Woodend Road, and the 8km Passchendaele Memorial Path connects Rangiora to Kaiapoi and runs along Lineside Road. These are shared paths and are fully sealed. The Urban Cycleways Programme is the single biggest investment in cycling in New Zealand's history, designed to build the best cycling network for the benefit of all New Zealanders. The shared path between Rangiora and Kaiapoi was officially named the Passchendaele Memorial Path, in memory of the huge sacrifice made at the Battle of Passchendaele. The 100-day battle was the biggest tragedy in New Zealand military history. On the first day of the attack, 845 New Zealanders lost their lives, more than any other single event in our post 1840 history. Waimakariri has a special link to the battle, being twinned with the Belgian municipality of Zonnebeke. View more information on other national cycleways that have been funded through the Urban Cycleways Programme. The cycleways were funded by the National Land Transport Fund, the NZ Transport Agency Urban Cycleways Programme and the Council. The Passchendaele Memorial Path begins at the Mafeking Footbridge near Smith Street and follows the Kaiapoi River stop-bank before passing beneath the rail bridge. The off-road path runs along Lineside Road on the western side of the railway line. The northern end of the cycleway connects into existing on-road facilities at Southbrook in Rangiora. We have worked with key stakeholders and adjoining property owners to establish this route. The Rangiora Woodend Path is on Rangiora-Woodend Road between Devlin Avenue and Chinnerys Road. It connects into on-road facilities along Kippenberger Avenue extending to East Belt. At Woodend, the path connects into off-road facilities extending to School Road. How wide are the shared paths? What type of surface do they have? Which side of the road is the Rangiora to Woodend path on? The design assessment process determined that the south side of Rangiora-Woodend Road was preferable. Are the cycleways only for bikes or can I walk/scooter on it? The cycleway are designated as a 'shared path' which allows pedestrians as well as bike riders, mobility scooters and wheeled scooters to use it. If you have additional questions please contact us on 0800 965 468. Some of our popular cycling tracks are listed below. The Visit Waimakariri website has an extensive listing of walking and cycling tracks. Contact the Kaiapoi i-SITE Visitor Centre for a copy of the Waimakariri Walking and Cycling Guide, featuring over 50 tracks which are suitable for all levels of fitness. The North Canterbury Cycling Club is an active club that can get you exclusive access to the private forest lands of Ashley, Mt Thomas and Okuku. They cater for both mountain bikers and road cyclists. There is a BMX track by the Ashley picnic ground in Millton Avenue, Rangiora. This track is run by the North Canterbury BMX Club. The Christchurch and Canterbury Tourism website has a list of cycling trails in the Waimakariri District, ranging from steep and rocky tracks to easy riding tracks through peaceful scenery. 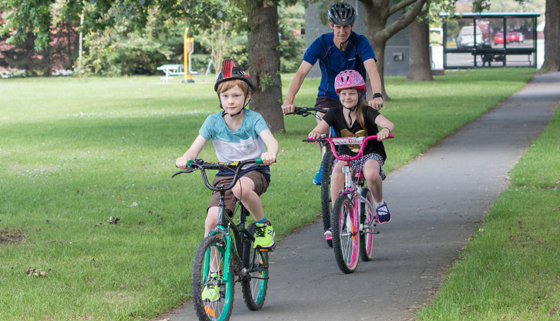 The latest Walking and Cycling Strategy for the district was approved by Council on 7 March 2016, and includes a detailed action plan of projects to be implemented in the next five years. The braided Ashley River is home to the wrybill and the riverbed is a significant breeding ground for this endangered bird. This walking track follows alongside the Ashley River, starting by the Ashley River Bridge picnic area at Millton Avenue. Follow the winding track to the railway bridge and return along the stopbank or track. Informal mountain biking tracks are formed along and on either side of the stopbanks of the Ashley River in this area - cyclists take care and watch for other track users. A fun and interesting way to explore Kaiapoi is by cycle or on foot - meander along the banks, see birdlife, seascapes and great fishing holes. You can choose the route and length of your ride or walk, along the riverbank and across the Kaiapoi river bridges. A number of attractive and historically interesting parks and reserves are linked together along the Kaiapoi River as it flows through the town of Kaiapoi. A continuous riverside pathway passes through these sites, providing opportunities for relaxation and exercise while enjoying the surroundings. Other interesting walks connect to the riverbanks and pass through attractive park areas within Kaiapoi. This walkway starts on the stopbank at the end of Park Terrace, Waikuku Beach, and you can choose from following the track down into the lagoon area or continuing along the stopbank to the SH1 road bridge. Return along riverbed tracks, with options of rejoining the stopbank track. The riverbed tracks lead to the Ashley River mouth, and at low tide the estuary can be crossed and a return along the beach or estuary. See views of the Ashley River, Saltwater Creek Estuary and the Ashley River mouth. This area is a significant breeding area of migratory birds and is the spawning ground of whitebait (inanga). Mountain biking is possible along the stopbank and on the riverbed tracks - cyclists take care and watch for other track users. The Pegasus Lake is a great destination for walking and cycling, with a formed track all the way round - 20-45 minutes return. Te Kohanga is the 97 hectare recreation and conservation area of Pegasus. Work has been underway to create a range of natural habitats so that it will once again support the variety and numbers of native plants and animals that once lived here. Formed pathways and boardwalks allow easy walking and cycling along this area. Access to the Tuhaitara Coastal Park can be gained from Pegasus. A mountain bike track can be ridden between Woodend and Waikuku Beaches (5 kilometres each way). Tūhaitara Coastal Park covers approximately 700 hectares of land along the coastline from the Waimakariri River mouth to the settlement of Waikuku Beach. Stretching along the coast for 10.5 kilometres, it comprises many natural features of local, regional and national importance. It is under the management of the Te Kohaka o Tūhaitara Trust. The Tūhaitara Coastal Park is a special environment that offers ecological, educational, cultural and recreational opportunities for all who visit. Tūhaitara Coastal Park can be accessed from Kairaki, The Pines Beach, Woodend Beach, Pegasus Town and Waikuku Beach. There is car parking at all of the beaches and access to the walking and cycling trails. Horse access to the park trails and the beaches is from Reid Memorial Ave at The Pines Beach, Ferry road at Woodend Beach or Kiwi Avenue at Waikuku Beach. More information and a map can be found on the Te Kohaka o Tūhaitara Trust website. There are a few mountainbike tracks starting from the View Hill Domain at the corner of Woodstock and Harman Gorge Roads near Oxford. Leave the domain, turn left into Woodstock Road, right into Ingrams Road. Turn left into Perhams Road, then turn right onto the road to Wharfedale Track. This is a dirt track with beautiful views across the Plains to the Port Hills. There are two fords which can become impassable in heavy rain, and four gates. The length of the track is 22 kilometres return. The more adventurous can continue onto Wharfedale Track. Leave the domain and turn left into Woodstock Road. Turn left into Washpen Road or continue to Waimakariri Gorge Road (2 kilometres further). Travel along Waimakariri Gorge Road, turn left into Rockford Road or continue along Waimakariri Gorge Road to Harmans Gorge Road, turn left and back to View Hill Domain. This is a 13 kilometre return ride. Continue along Woodstock Road to the end and zigzag down the dirt track to the Waimakariri River. Return to the corner of Woodstock and Waimakariri Gorge Roads. Either continue straight along to View Hill Domain or via Waimakariri Gorge Road, Rockford Road and Harmans Gorge Road. From the domain, turn left into Harman Gorge Road, then turn right into Island Road. Follow Island road (shingle part way). Turn left at Sladdens Farm Road and continue on Island Road through the ford, then right at Woodside Road. This route will take you to Oxford (11 kilometres one way). To return to the domain rather than travel to Oxford, turn right at either Raineys Road (unsealed and through a ford) or further along at McGraths Road (unsealed). At the end of either road turn right into Woodstock Road.